According to NAR, in 1Q 2015, the national median existing single-family home price was $205,200, an increase of 7.4 percent from 1Q 2014. Although rising home prices generally are good for the overall market, they are pushing affordability down, which might make it harder for lower-income or first-time homebuyers to enter the market. Real estate agents can help these clients by working with lenders who offer a wide variety of loan products to meet each borrower’s needs. After massive declines in home values during the housing crisis, most in the real estate industry look upon rising home prices favorably. Increasing values indicate that the market is recovering, and homeowners are regaining some of the equity they lost. According to the National Association of Realtors, in the first quarter of this year, the national median existing single-family home price was $205,200, an increase of 7.4 percent from first-quarter 2014. And prices are rising across the country. In that same time frame, median prices increased in 148 out of the 174 metropolitan statistical areas that NAR tracks. Although rising home prices generally are good for the overall market, they are pushing affordability down, which might make it harder for lower-income or first-time homebuyers to enter the market, as well as for established homeowners to move up within their market. 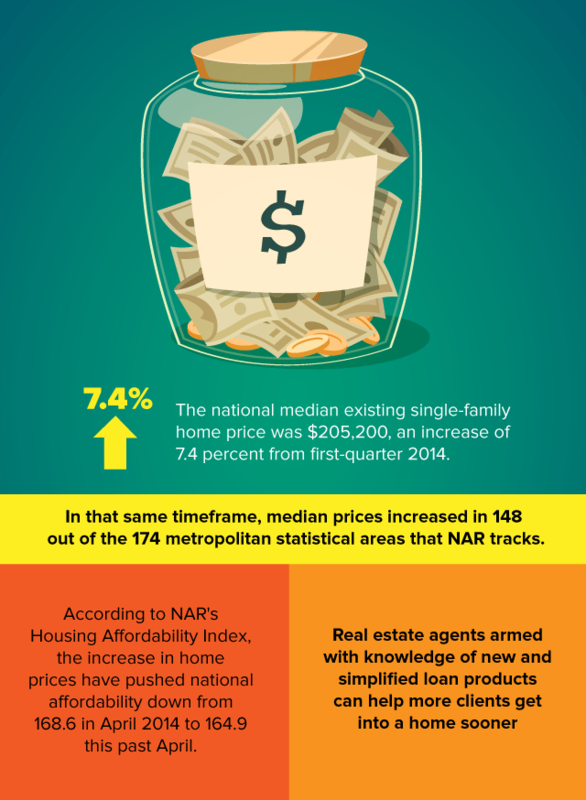 According to NAR’s Housing Affordability Index, the increases in home prices have pushed national affordability down from 168.6 in April 2014 to 164.9 this past April. With affordability numbers on the edge in many markets, now might be the time for consumers on the bench to get into the game before prices and interest rates increase further. Real estate agents armed with knowledge of new and simplified loan products can help more clients get into a home sooner — and prevent buyers from getting priced out of buying a home. There are many existing programs for first-time homebuyers, and most real estate agents are aware of the financing resources offered by government agencies such as the Federal Housing Administration (FHA), state-sponsored down payment assistance programs and more. But independent mortgage lenders are stepping in to help, as well, particularly for those in underserved market segments, such as borrowers with low credit scores. By offering simplified mortgages, lenders help inexperienced buyers navigate the complexities of home financing and take the leap to homeownership. Simplified loan products can help expedite and package the homebuying process for the consumer, which might be increasingly important as home prices and interest rates rise. Real estate agents can help clients get into the home of their dreams by researching and partnering with lenders who offer programs tailored to first-time homebuyers and credit-challenged borrowers. Look for lenders responding to market needs by lowering their credit score requirements, extending eligibility and minimizing financing overlays. Look for lenders who lower their credit score requirements, extend eligibility and minimize overlays. Some lenders are even offering unique loan products specifically catering to this market, with no closing costs or upfront financing fees. These types of loans simplify the mortgage process and remove some of the barriers to homeownership that the market has put up since the housing crisis. Many first-time homebuyers or borrowers with low credit scores don’t have a lot of cash on hand for closing costs and the many fees that come up during the homebuying transaction. But real estate agents can help these clients by working with lenders who offer a wide variety of loan products to meet each borrower’s needs. These simplified loans not only help cover the upfront costs of purchasing a home, but they also help alleviate some of the stress of the process for borrowers. Finding the right financing without the anxiety and potential chaos of unexpected fees and increases means happy homeowners. And those homeowners are likely to not only return to the real estate agent who helped it all happen, but also to refer friends and family. As affordability factors more and more into homebuying decisions, now might be the critical time for first-time homebuyers and lower-credit borrowers to enter the market before interest rates and home prices climb further. Many are predicting home prices will increase at a single-digit rate more this year and that interest rates might rise as well. Real estate agents should arm themselves with knowledge of the vast array of loan programs available to meet their clients’ needs, so they can help more potential homebuyers become homeowners before affordability declines further. Agents must have the knowledge of the vast array of loan programs to meet their clients’ needs.